The official name of China is the People's Republic of China. 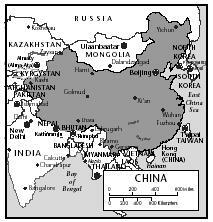 Eastern China is made up of lowlands, whereas the middle and western sections of the country are mountainous. The largest river in China is the Yangtze, which travels almost 4,000 miles. Water pollution is a problem in China, but most Chinese people have access to safe drinking water. Throughout its history, China's growing population has been difficult to feed. By A.D. 1000, China's population reached 100 million (more than one-third of the U.S. population in 2000). The Chinese constantly had to adapt new eating habits because of the scarcity of food. Meat was scarce, so dishes were created using small amounts of meat mixed with rice or noodles, both of which were more plentiful. Vegetables were added, and stir-frying, the most common method of cooking, became a way to conserve fuel by cooking food quickly. neighboring Mongolia swept into China. Cooking styles and customs began to be exchanged between the two countries. As people traveled further from their homes, cooking methods and foods were shared among the different regions within China. The Chinese eat many foods that are unfamiliar to North Americans. Shark fins, seaweed, frogs, snakes, and even dog and cat meat are eaten. However, the Chinese follow the spiritual teaching of balance signified by yin ("cool") and yang ("hot"). This philosophy encourages the Chinese to find a balance in their lives, including in the foods they eat. While preparing meals, the Chinese may strive to balance the color, texture, or types of food they choose to eat. Rice is China's staple food. The Chinese word for rice is "fan" which also means "meal." Rice may be served with any meal, and is eaten several times a day. Scallions, bean sprouts, cabbage, and gingerroot are other traditional foods. Soybean curd, called tofu, is an important source of protein for the Chinese. Although the Chinese generally do not eat a lot of meat, pork and chicken are the most commonly eaten meats. Vegetables play a central role in Chinese cooking, too. There are four main regional types of Chinese cooking. The cooking of Canton province in the south is called Cantonese cooking. It features rice and lightly seasoned stir-fried dishes. Because many Chinese immigrants to America came from this region, it is the type of Chinese cooking that is most widely known in the United States. Typical Cantonese dishes are wonton soup, egg rolls, and sweet and sour pork. The Mandarin cuisine of Mandarin province in northern China features dishes made with wheat flour, such as noodles, dumplings, and thin pancakes. The best known dish from this region is Peking duck, a dish made up of roast duck and strips of crispy duck skin wrapped in thin pancakes. (Peking was the name of Beijing, the capital of China, until after the Cultural Revolution of the late 1960s. This traditional recipe is still known in the United States as "Peking duck.") Shanghai cooking, from China's east coast, emphasizes seafood and strong-flavored sauces. The cuisine of the Szechuan province in inland China is known for its hot and spicy dishes made with hot peppers, garlic, onions, and leeks. This type of cooking became popular in the United States in the 1990s. Tea, the beverage offered at most meals, is China's national beverage. The most popular types of tea—green, black, and oolong—are commonly drunk plain, without milk or sugar added. Teacups have no handles or saucers. Mix ground pork (or beef), scallions, egg, salt, soy sauce, sugar, sesame oil, and water in a bowl. Place 1 teaspoon of meat mixture in the center of a wonton skin. Moisten the edges of wonton skin with water and fold it to form a triangle. Press the edges together to seal. Fill and fold the rest of the wonton skins. Bring a large pot of water to a boil to cook the wontons. Add a few wontons at a time to the boiling water, giving them room to float freely. Cook over medium heat 8 to 10 minutes. Add the cooked wontons to hot broth. Use about 3 dozen wontons for 6 cups of broth. 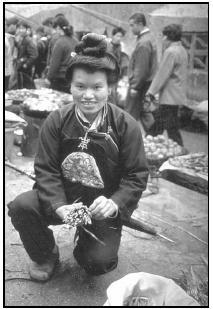 A young Chinese vendor, with her hair styled in an elaborate bun, prepares vegetables to sell. All styles of Chinese cooking use fresh vegetables. Remove the egg from the refrigerator and allow it to come to room temperature. Beat the egg lightly in a bowl. Put the stock in a saucepan or wok and bring to a boil. Lower heat to the lowest setting. Hold the bowl with the beaten egg above the pan with the simmering broth. Slowly and carefully pour the egg into the broth in a very thin stream. Hold a fork in your other hand, and trace circles on the surface of the broth, drawing out long filmy threads of egg on the surface of the broth. Simmer for about 1 minute, and then remove the saucepan from heat and cover for 45 seconds. The egg should be set in tender flakes. Add salt, sugar, and soy sauce, and sprinkle the scallions on top. Stir the mixture two or three times. Note: This recipe involves hot oil and requires adult supervision. Prepare rice according to package and keep warm. Mix flour, salt, and pepper in a large plastic bag with a locking seal. Add the pork pieces to the bag and seal. Shake the bag well to coat each piece. Remove the pork and throw the bag away. Cook the pork pieces on all sides until brown. Lower the heat and cook for 20 minutes. Add the peppers, onions, and carrots, and cook for 5 minutes. Stir in pineapple, pineapple juice, vinegar, soy sauce, brown sugar, cornstarch, and food coloring. Cook until the mixture is hot. Combine the rice, water, and salt in a large pot. Heat until almost boiling, stirring often. Lower the heat, cover pot, and simmer for 15 minutes, or until most of the water has been absorbed. Stir in the milk and sugar. Cook uncovered for 30 to 40 minutes, or until mixture is thick and creamy, stirring often. Serve topped with sliced almonds, whipped cream, or a sprinkle of cinnamon. Ingredients ready for preparation of fried rice include (clockwise from top) chopped scallions, sliced mushrooms, bean sprouts, chopped red and yellow pepper, and sliced water chestnuts. In the bowl are three beaten eggs. Cook rice according to instructions on package. Heat the oil in a wok or skillet over high heat. Add rice and fry until hot, stirring constantly. 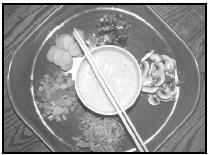 Add the green pepper, mushrooms, water chestnuts, bean sprouts, and scallions, stirring often. Push the mixture to the sides of the wok or skillet, making an empty space in the center of the rice mixture. Pour beaten eggs into the empty space. Let the eggs cook halfway through. Blend the eggs with the rest of the rice mixture. Heat until the eggs are fully cooked. Sprinkle the chopped parsley over each serving. Although day-to-day cooking in China is quite simple, elaborate meals are served on holidays and festivals. A typical holiday meal might consist of steamed dumplings, suckling pig (or a spicy chicken dish), and a selection of desserts. Unlike in the United States, desserts are generally reserved for special occasions only. Most ordinary meals end with soup. The most important festival of the year is the Chinese New Year, which is set according the phase of the moon, and falls in January or February. Oysters are believed to bring good fortune and have become a traditional food for dinners celebrating the New Year. Oranges and tangerines (for a sweet life), fish (symbolizing prosperity), and duck are also eaten. Dumplings are commonly eaten in the north. Neen gow, New Year's Cake, is the most common dessert. Each slice of the cake is dipped in egg and pan-fried. A special rice flour makes the cake slightly chewy. Another important holiday is the Mid-Autumn Festival in September. To celebrate this festival, which occurs during the full moon, the Chinese eat heavy, round pastries called mooncakes. They are filled with a sweet paste and sometimes have an egg yolk in their center. Other foods eaten at this time are rice balls and a special cake called yue bing. After a baby is one year old, the Chinese only celebrate birthdays every ten years, starting with the tenth birthday. The Chinese eat noodles on their birthdays. They believe that eating long noodles will lead to a long life. Another traditional birthday food is steamed buns in the shape of peaches, a fruit that also represents long life. In a large bowl, use a fork to stir the peanut butter or sesame paste with the water until it is creamy. Stir in the soy sauce and honey. Add the noodles to the peanut butter mixture and mix well. Refrigerate the mixture until ready to serve. Serve the noodles cold, topped with scallions, sprouts, or chopped peanuts. Rinse the chicken in cool water and pat dry with paper towels. Mix the soy sauce, garlic, pepper, sugar, and oil in a bowl. Thoroughly coat the chicken pieces with this mixture, reserving a little mixture in the bowl. Let the chicken stand (marinate) for 2 to 4 hours in the refrigerator. Place chicken into a lightly oiled baking pan. Bake for about 40 minutes. Every 10 minutes during roasting, turn the chicken and use basting brush to brush on the remaining soy sauce mixture. When the chicken is tender, remove from oven. Arrange pieces on a bed of lettuce on a serving platter and serve warm or at room temperature. To make Almond Cookies, press a whole almond into the center of each dough ball. Preheat oven to 325°F. Grease cookie sheets. Mix flour, sugar, baking soda, and salt in a bowl. With a fork, slowly add shortening, a little at a time, to the flour mixture. Add the beaten eggs and almond extract. Shape the dough into balls the size of a large cherry. Place the dough onto the cookie sheets and press an almond into the center of each cookie. Togetherness and cooperation is reflected in China's mealtime customs. A dish is never served to just one person, either at home or in a restaurant. Each person has his or her own plate, but everyone at the table shares food. Instead of a knife and fork, the Chinese eat with chopsticks, a pair of wooden sticks held in one hand. Food is cut into bite-size pieces while it is being prepared, so none of it has to be cut at the table. It is considered good manners to hold a bowl of rice up to your mouth with one hand. Chopsticks, held in the other hand, are used to help scoop the rice into the person's mouth. Drinking soup directly from the bowl is also an acceptable custom. It is rude, however, to leave chopsticks sticking straight up in a bowl of rice. A typical family dinner consists of rice or noodles, soup, and three or four hot dishes. At a formal dinner, there will also be several cold appetizers. A well-known type of Chinese snack is called dim sum ("touch of heart"). These are bite-size foods served with tea in midmorning, afternoon, or at night. Typical dim sum are filled dumplings, shrimp balls, and spring rolls (also called "egg rolls" in the U.S.). Wontons, which can be boiled in soup, are also served fried as dim sum. Prepare wontons according to recipe for Wonton Soup (or purchase packaged wontons). Fry in hot oil until golden brown and crispy. Drain the wontons on a paper towel and serve hot with duck sauce (sweet and sour sauce). Note: This recipe involves hot oil and adult supervision is required. In a large bowl, beat eggs with 1½ Tablespoons of peanut oil until bubbles start to form. Add the shrimp to the beaten eggs and gently stir. Mix in the salt, pepper, and scallions. Heat 2 Tablespoons of peanut oil in a wok or large skillet over high heat for about 20 seconds. Tip the skillet or wok back and forth carefully to coat it thoroughly with oil. Stir the eggs briefly once again, and pour the mixture into hot skillet or wok. Cook the eggs, stirring gently with a wooden spoon until scrambled, about 3 minutes. Turn off heat and transfer eggs to a heated platter and serve. Sprinkle with scallions. The rapidly growing population in China has been difficult to feed throughout history. About 13 percent of the total population in China is undernourished according a report issued by the World Bank in 2000. This problem is most significant away from coastal areas. People living in inland areas are more likely to be poor and to have a diet lacking in adequate nutrition. About 17 percent of children under age five are underweight. Albyn, Carole Lisa, and Lois Webb. The Multicultural Cookbook for Students. Phoenix: Oryx Press, 1993. Beatty, Theresa M. Food and Recipes of China. New York: PowerKids Press, 1999. Bremzen, Anya von, and John Welchman. Terrific Pacific Cookbook. New York: Workman Publishing, 1995. Cook, Deanna F. The Kids' Multicultural Cookbook: Food and Fun Around the World. Charlotte: Williamson Publishing, 1995. Foo, Susanna. Chinese Cuisine. Shelburne, VT: Chapters Publishing, 1995. Insight Guide China. London: APA Publications, 1998. Lo, Eileen Yin-Fei. Chinese Kitchen. New York: William Morrow, 1999. Yan, Martin. Chinese Cooking for Dummies. Foster City, CA: IDG Books, 2000. Yu, Ling. Cooking the Chinese Way. Minneapolis: Lerner Publications, 1982. Chinese ingredients can be found in many large grocery stores. Most cities have Chinese restaurants (where take-out versions of many recipes are available), and many have Asian specialty grocery stores. Look in the business pages of your local telephone book to find specialty grocery stores in your area. Specialty Orient Foods, Inc. 43-30 38th Street Long Island City, New York 11101 1-800-758-7634; [Online] Available http://www.sofi-ny.com/mail_order/english/mail_order_main_e.htm (accessed January 28, 2001). The Oriental Pantry 423 Great Road (2A) Acton, MA 01720 (978) 264-4576; [Online] Available http://www.orientalpantry.com (accessed January 28, 2001). Asia Foods. [Online] Available http://www.asiafoods.com (accessed January 28, 2001). Chinese Cuisine with Rhonda Parkinson. [Online] Available http://chinesefood.about.com (accessed January 28, 2001). 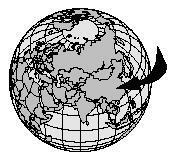 There is no province in China called "Mandarin Province." Beijing did not change its name. The method of transliterating the Chinese changed. The Chinese always said Beijing. "Most ordinary meals end with soup." That depends on where you are in China. Here in Guangxi, soup comes first or at the same time as other dishes. "After a baby is one year old, the Chinese only celebrate birthdays every ten years, starting with the tenth birthday." Nonsense. "...pastries called mooncakes... Other foods eaten at this time are rice balls and a special cake called yue bing." Have found your site very interesting- as librian at a Peterborough school Senior- the students are holding a international study day- and found your information very useful. would have liked a few pictures but wonderful site.